The Roebling Point Planning Committee for the City of Covington is meeting tonight from 6pm to 8pm to discuss design, land use, economic conditions and potential public improvements in the Roebling Point area of Covington. The Committee hopes to take the information gathered at this meeting and use it to formulate plans and recommendations for changes that might be made in the area. 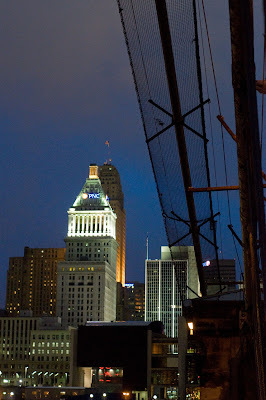 Meanwhile the Roebling Suspension Bridge, connecting downtown Covington with downtown Cincinnati, is getting a fresh coat of paint. The new coat will help protect the 144-year-old river span designed by German immigrant John A. Roebling who later gave the world New York City’s famed Brooklyn Bridge. 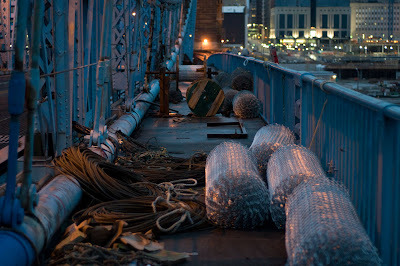 Work continues on the bridge’s new paint job – photos by Jake Mecklenborg. Specifically, the paint will protect the suspension cables from rust and corrosion, and thus extend the serviceable life of the bridge. 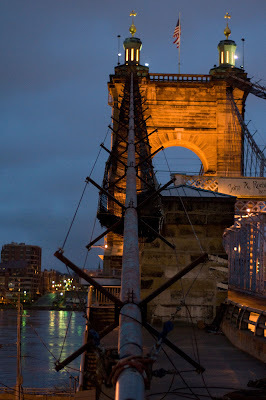 In 2007, the Roebling Suspension Bridge had a new 11-ton weight limit put in place by the state of Kentucky that prohibited large vehicles, most notably TANK buses, from crossing the span to help preserve the bridge’s functionality for automobiles and pedestrians. The $16.2 million paint job is ongoing and will continue for another eight months before the bridge will finally be reopened to automobile traffic in November 2010. During that time, project officials state that pedestrians will still be able to cross on the bridges walkways as they normally would. The Roebling Point Committee meeting is being held at the Commission Chambers at Covington City Hall (map). Those driving to the meeting are instructed to park in the City Center Garage adjacent to Covington City Hall, and bring their parking receipts for validation.